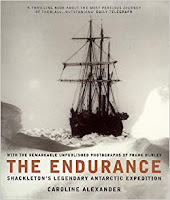 In 1914, explorer Ernest Shackleton set out to become the first man to cross the frozen wastes of the Antarctic continent on foot; however, a combination of treacherous conditions, unexpected changes in weather, and simple bad luck left Shackleton and his crew of 28 men stranded in one of the world's most unforgiving environments for nearly two years. The Endurance: Shackleton's Legendary Antarctic Expedition, adapted from the book by Caroline Alexander, combines Hurley's material with newly shot footage tracing the path of Shackleton's journey, presenting a remarkable true-life tale of courage and human survival against grim odds. Liam Neeson narrates.